Help keep your Business Cards from getting "Lost in the Shuffle". Our Card Designs are carefully crafted by experienced graphic designers to be eye-catching while maintaining the official feel that is required by most law enforcement agencies. 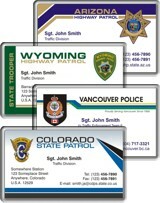 High Quality Printed Media designed specifically for the Mounted Police in Canada. Trading Cards are an easy, low-cost way to help stimulate dialogue between the police and the community, especially the youth. If your goal is to connect with young people then this is the way to do it. These are very collectable and the Kids just love them! These Collectable Prints fit into any standard 8"x10" frame. A fantastic collectable gift idea! Order any Collectable Print and we will double your order for FREE ! Order a Print for yourself and get a Print to give away for free! Response to these Card Designs has been delightful. Many clients have praised the quality and service we provide. Here you may view several of the comments we have received. This web site uses the 'Secure Sockets Layer' for all ordering forms and personal data. SSL, with 128 Bit Encryption provides a very high level of security when submitting your data on the Internet. Using your credit card with a SSL secured web page can actually be safer than using your credit card at a store. All ordering forms on this web site should display a lock image in the status bar of your Browser. This image tells you that data from any web page that displays it is encrypted.